We’re three lessons deep, and I hope you’re starting to get an idea of what you should be doing. Or, at least, what you shouldn’t be eating. You’re on board with avoiding grains, sugar, and vegetable oils, yes? You get that, owing to their recent introduction into the human diet, people aren’t adapted to eating these foods. You see that contrary to being health-giving, grains, vegetable oils, and sugar are actually destroying our health and making us fat and sick. You’re interested in switching from the sugar-burning Carb Paradigm to the Fat Paradigm, and you understand that you should be eating more animals and fewer carbs to lose weight, right? Awesome…but what’s next? I’ve given you a few basic tools to identify what foods might be preventing fat loss and promoting poor health, so you generally know what not to do, but now you want the details on what you should be doing. Specifically, what you should and should not be eating. Let’s bring it all together and spell it out. And because when we’re talking about our health and happiness, we don’t want to beat around the bush, or get things half-right. We want to be sure. Don’t eat that stuff. For one, it’s junk food that simply doesn’t taste very good when you get down to it. Instead, it’s food that’s designed to target the reward centers in your brain and get you to stuff your face – and then go out and buy some more. “Betcha can’t eat just one” isn’t just an innocent slogan; it’s the literal truth! Two, it’s high in calories but low in nutrition. You can eat that bag of Lay’s and get hundreds of calories of carbs and rancid fats, but you’ll still be deficient in vitamins and minerals, and you’ll still be hungry! I’ll be honest – you could stop here and reap most of the benefits. Because the aforementioned “food” groups are so heavily overrepresented in the modern food supply, avoiding them and just eating everything left over will make you healthier and help you lose weight. But we can do better than that. Eat the animals, vegetables, fruits, nuts and seeds our bodies are adapted to thrive on. Eat animals: beef, lamb, bison, pork, poultry (and their eggs). Favor grass-fed and pastured animals, which have better fatty acids and contain more vitamins and minerals (and taste better!). Eat animals from the sea: salmon, sardines, trout, mackerel, crab, shrimp, oysters, mussels, clams. Wild-caught fish are best, though farmed shellfish are usually raised exactly like wild shellfish and thus are fine. Eat unlimited produce: leafy greens of all kinds, colorful plants, berries, cruciferous vegetables, assorted fruits, roots, and tubers. Eat some nuts and seeds: macadamias, walnuts, cashews, almonds, pecans, brazil nuts, pistachios, hazelnuts; pumpkin, squash, and sunflower seeds. Use healthy cooking fats: butter (especially grass-fed), coconut oil, olive oil, red palm and regular palm oil, ghee, and animal fats (lard, tallow, duck fat, etc.). Stock spices: keep plenty of herbs and spices on hand. Cumin, coriander, thyme, rosemary, sage, chili powder, mint, turmeric, and cayenne are a few of my favorites, but you can use anything else you like. Spices and herbs add flavor to dishes and prevent the breakdown of vital nutrients during cooking so that when you add spices or herbs, your food tastes better and is actually healthier for you. 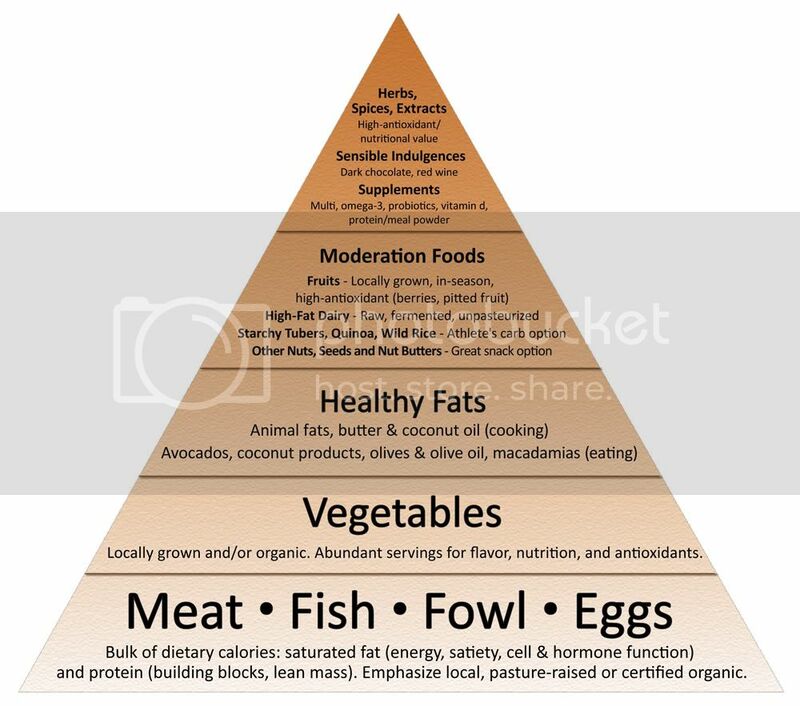 All of this and then some is nicely summarized in The Primal Blueprint Food Pyramid (click to enlarge). Follow those basic guidelines and avoid the foods I’ve already mentioned, and you’re good to go. If you want some concrete recipe ideas, check out the resources I introduced in lesson 2: the online recipe guide on Mark’s Daily Apple, the reader-created cookbooks, The Primal Blueprint Cookbook and The Primal Blueprint Quick & Easy Meals. Or, if you want to make something a little quicker and easier, I’ve got you covered. I realize that not everyone always has time to prepare a proper meal. I certainly don’t, which is why I created Primal Fuel, a whole foods-based meal replacement shake. Coconut fat, whey isolate protein (the gold standard of protein powders), natural sweeteners, real cocoa or vanilla, and prebiotic fiber for good gut health… I have a Primal Fuel shake nearly every day and it’s perfectly Primal (and tasty, too!). So – what do you think? A “diet” composed of fresh meat, all the veggies you want, plenty of fruit, a few nuts, some delicious fat, a diverse arsenal of spices and herbs, and delicious coconut shakes doesn’t sound so restrictive, does it? Stay tuned for Lesson 5 tomorrow. This is the fourth of a 7-part course on how to achieve lifelong health with the Primal Blueprint. If you are not already a subscriber, click here to gain access to the rest of the lessons. You can unsubscribe at anytime and your email address will never be shared.